In the anime series Noragami, there’s a lot to offer – including action, humor, drama and unlikely gods. Yato may be considered to be a minor god-like being, but that doesn’t stop him from dreaming big like the rest of us. His plans may not always go as he would hope (for example, not a single person has a shrine to Yato the god of depravity) but it doesn’t stop Yato from thinking highly of himself and exuding confidence. In the first half of the series, Yato was in search of a regalia (aka divine weapon that comes from a human spirit) and located Yukine, the 14 year old who generally has an aloof demeanor. Opposite the pair of Yato and Yukine is Hiyori, a half human half Ayakashi with enhanced abilities to perceive the otherworldly events who “changes” Yato’s life. After establishing the core three and a few other major players like the god of war Bishamon, the anime took the time to introduce us to the characters personalities before more naturally diving into their lives with less time to feel introductory. Sure, things for Yato haven’t exactly changed (Yukine still seems to care less about Yato and he’s still gullible and broke) but we immediately recognize the fact that he is doing his best to avoid a face off with Bishamon for the crimes of murdering her past regalia (and if you don’t remember, she had plenty.) In the first half, there wasn’t as much time spent to humanize her to viewers, but after just moments season 2 uses her regalia to show us a more grounded version of the god of war. As we already knew, Bishamon holds great disdain towards Yato, but a third party becomes involved in the long running conflict that ignites a larger feud with multiple lives being at risk. The relationship between regalia and gods takes a lot of the run-time which was a strong contributing factor to my enjoyment of Noragami and proving to be different than the well known series Soul Eater. The first half used mostly Yato and Yukine, but the initial punchline of Bishamon having countless shows the broken souls she’s saved and a pleasant way to flip the original plot of the anime series. One of these regalia-focused choices involves Yukine and a regalia of Bishamon’s finding friendship while a war brews to remind us of the innocence some of these kind-hearted figures have before using them as a tool. Loss taints the series with a grim tone in part two, something felt by the already distraught Yukine more than others. As mentioned, Yukine shined in season one of the anime, with season two elaborating on his life since becoming a regalia and losing his human life. For being so young, he seeks out answers and deeper thoughts about how it will affect those he cares for and that’s only just the start of mature transitions for Yukine in Noragami. Yato does his best to take on the role of a guardian or parental figure of Yukine, sometimes coming off unwarranted to Yukine, but as most parents his intentions are to protect the young regalia. Despite taking those serious turns, the series still finds plenty of time to use the unserious persona of Yato and the teenage rebellion of Yukine to keep things from getting too heavy and limiting the audience – a nice tactic to enlist fans of more than one genre. The series may have the perks of alternating tone, but by the end nobody can say that it doesn’t become an emotional rollercoaster for one character – and those who wanted to protect said person. It brings up a notion that even with these practically immortal figures, there can still be repercussions that hold a greater sadness than an easy death. Without spoiling it, this moment I make reference to takes the anime down a slightly darker path than we had anticipated. By the series end, there is hope and change instilled in multiple key figures in Noragami Aragoto to leave room for more storytelling and more importantly, a good reason to return to this anime world. The animation of Noragami Aragoto is done by the widely recognized Studio Bones (Fullmetal Alchemist: Brotherhood, Space Dandy) who is responsible for bringing the second season to life so vividly. The character designs fluctuate as needed with the obscure changes, but the usage of the regalia’s and their internalized form (like Bishamon’s for example) are the more important scenes visually. 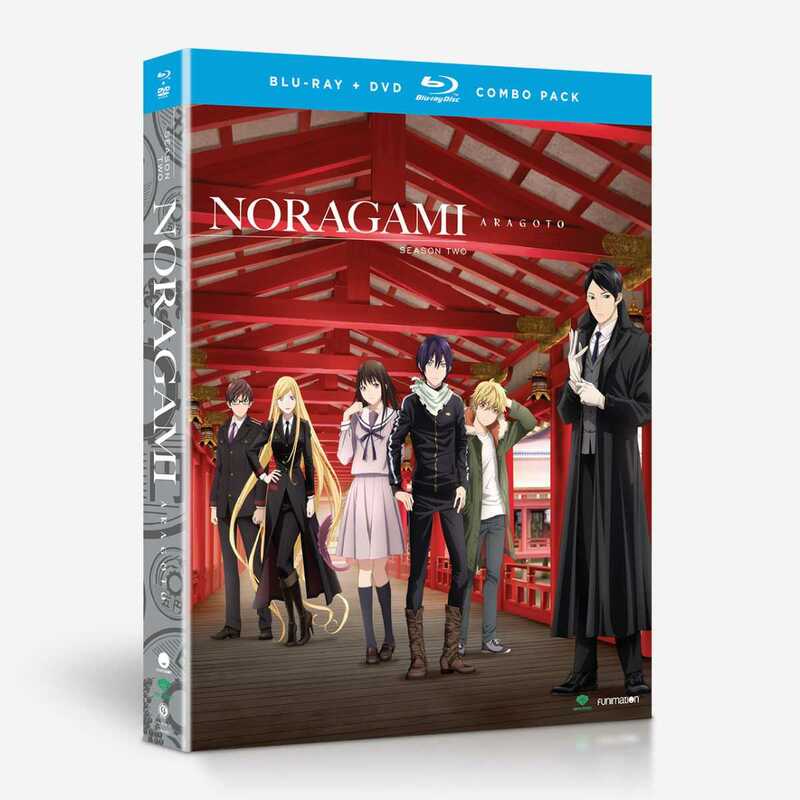 Funimation followed up the success of the first Noragami with another wonderful English dub of the series and gave it a spectacular box set to follow the first half with special collector’s perks like additional art cards. Noragami Aragoto returned with more serious innuendos, hope for growth and hints at a larger budding storyline, making it a solid anime sequel that matches (and even surpasses on occasion) the first season. – Yukine was put through quite a lot once again but manages to rise above as he should. – There were plenty of similarities between the first and second season with an edge added to season 2. – Storyline hints at the end make it clear that Noragami should return to explore what’s to come. I love Noragami but I would really like a third season because it just seems like there is so much story left to tell with these characters. Thanks for sharing your thoughts on it.